of the California Coastal Act. Background. The California Coastal Initiative (Proposition 20), overwhelmingly passed by the voters in 1972, was made permanent by the California Coastal Act of 1976. The Coastal Act is administered by the California Coastal Commission, and is supplemented by Local Coastal Programs (LCPs), which are approved by the Commission and administered by our local governments. In San Mateo County, we have two LCPs, one for Half Moon Bay, and one for the rest of the county's coastside. Our Mission. 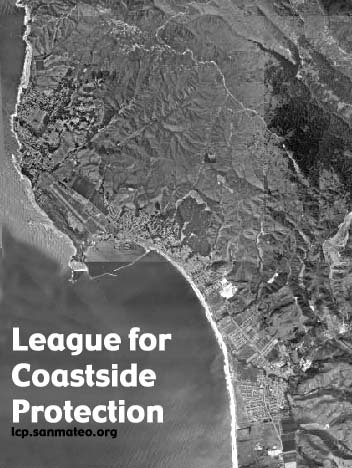 The League defends the coast by supporting those who uphold the spirit and substance of the California Coastal Act. We work to elect responsible public officials who will preserve and enhance the quality of life on the coast for residents and visitors, protecting the coastside environment, agriculture and fisheries. Our Local Coastal Programs supplement the Coast Act. They reflect years of negotiation and planning, and will protect the place we live, but our local government officials need to hear us demand enforcement. We can use the ballot box to deliver the message: enforce our laws. You can get your own copy here, or learn more about just what is a Local Coastal Program. Learn more about why we formed the League. Join us. Over 200 people have so far. Help elect people who respect our laws, and will use them to protect our communities and natural resources. To join, please drop us a note at . We need and welcome contributions and volunteer efforts; Download an endorsement and donation form, ready to print and mail. Learn more about issues elected officials face. Learn more about Wavecrest and the school board. What part does a school board play in development? What's the big deal about raptors? wetlands? Read about it, vote for planning law supporters, and contact the Coastal Commission, too. Enjoy beautiful photos of the coastline we're working so hard to protect. The California Coastal Commission approved an LCP update August 2012. Browse the staff report and update. Also check out these planning documents and maps and LCP Resources Map. Half Moon Bay does not provide electronic versions of the LCP. Paper copies can be obtained for $34 from HMB City Hall. or the whole thing (a whopping 9.4 MB), 240 pages. If your eyes are good, and want to save paper, this version prints 4-up and prints on 60 pages. For best viewing, we recommend opening PDFs directly in Acrobat Reader rather than in your browser. We'll see if the City will help out by providing the text so we can make a much smaller version available. The San Mateo League for Coastside Protection is a California political action committee (ID 1234363), founded in May of 2001. Contact us at PO Box 3560, Half Moon Bay, CA 94019, 650-726-9280, or . While we admire their long-standing dedication and hard work, we are not affiliated with the League for Coastal Protection, a non-profit statewide education and advocacy organization committed to the protection of sensitive coastal resources and the enforcement of the policies of the California Coastal Act. Every candidate or issue that we have taken a position on is here or on our past endorsements & events page. If it's not, we didn't take a position on it.